We'll send you information that you will look forward to! This elegant, inviting home offers a great combination of unique features. Very gracious living level with arched doorways and windows evokes Spanish Revival style. Its 10’ ceilings are accentuated by intricate crown molding and architectural beams; wide plank hardwood floors and a working wood-burning fireplace make the space feel warm and welcoming. There is an office nook with skylights as well as a beautifully remodeled full bath, formal foyer and a large pantry area. The home’s two bedrooms are on the lower level accessed by an elegant, wide staircase. The master bath offers a true spa experience with double sinks, heated floors, soaking tub, steam shower, meditation area and great lighting. The master closet is a thoughtfully built walk-in; a full laundry room on this level with front loading, side-by side appliances is pretty and practical. There is also a private terrace accessed through a large sliding door in the second bedroom. The wine cellar located below the bedroom level is a wine-collectors dream and was built to accommodate close to 1,000 bottles. The home comes with a private garage and is part of a unique collection residences called Las Casitas that is known for the “Las Casitas Tram” – a funicular that rises up the hill taking homeowners to their front door. 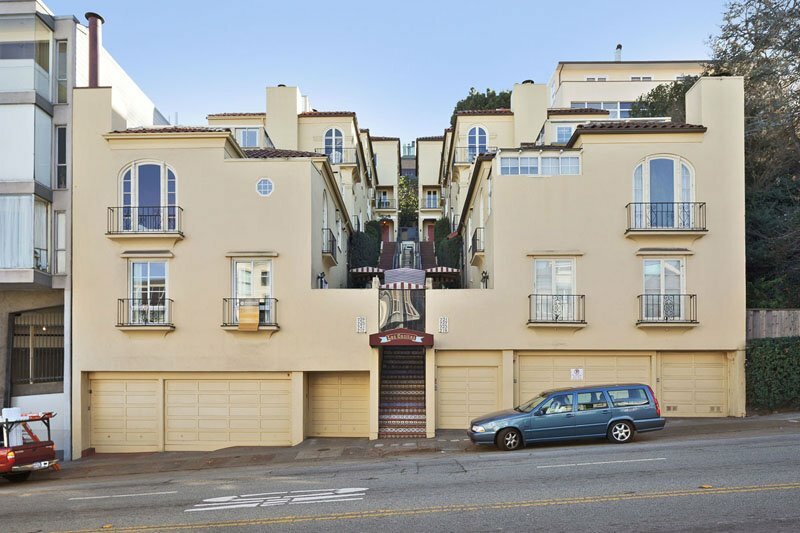 Located in Russian Hill, short walk to the best of North Beach, the waterfront and the Hyde Street trolley, this is a lovely part of San Francisco to call home.